The best way to cook a frozen lobster tail at home....Baked Lobster Tail is simple and fool proof. Tender, juicy and sweet...this is the perfect dinner to impress. Carefully, using kitchen shears, cut the top of the lobster shell horizontally from the front to the tail. Using your hands, carefully loosen the meat from the shell and lift it up through the top of the shell. Lay the lobster meat on top of the shell and arrange on a baking sheet meat side up. Place 1 tablespoon of butter on top of the lobster meat and repeat with the remaining lobster tails. Bake the lobsters for approximately 10-12 minutes or until the meat is white, firm and no longer translucent. 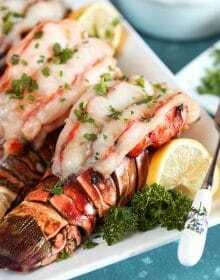 Drizzle the lobster tails with melted butter and sprinkle with fresh snipped herbs, if desired. Serve with lemon wedges.